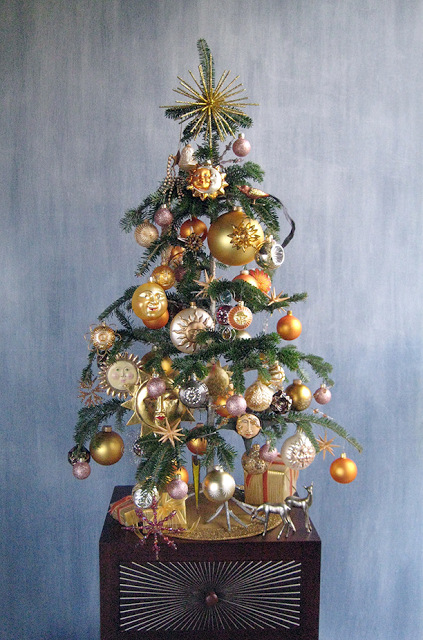 I've come to admire a blogger who creates the most beautifully decorated trees of anyone I know. I think you will agree, once you see them for yourself, that Darryl Moland's eye for color and design is nothing short of brilliant. We come to associate a decorated tree with Christmas and the winter season, but if you take a moment to rethink the possibilities presented by Darryl in his blog, The Decorated Tree (of Life), you may find yourself wanting to have a decorated tree in your home year round. A true artist who uses trees as his blank canvas with which to work, Darryl expertly arranges adornments based on season, holidays and special celebrations. His graphic design and photography background is evident in each of his arrangements, but so is Darryl's expressive flair for creating harmony with such effortless skill. I love the fact that many of his arrangements are for tabletop trees, because it gives one the ability to place it just about anywhere in the home. Darryl has taken his passion of artfully displaying decorative trees and has written a book dedicated to the subject of celebrating the seasons. 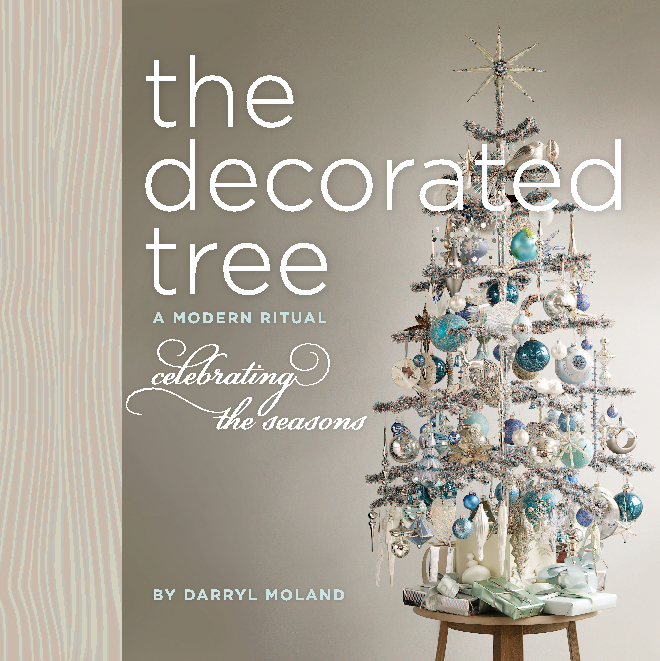 The Decorated Tree, A Modern Ritual can be purchased in either hardback or in PDF form by clicking on the link. Scroll through the free preview to get a taste of what the book is about. This is a glimpse of Darryl's oeuvre. 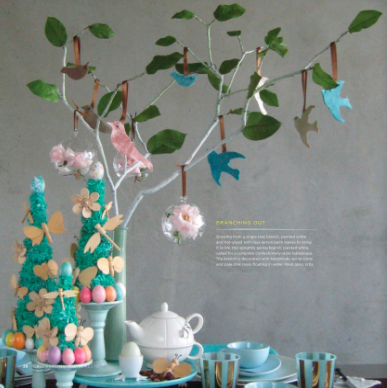 Isn't this glorious Easter table setting absolutely marvelous? I love the whimsical teal-colored topiaries that are festooned with beautiful spring bugs and dyed Easter eggs. 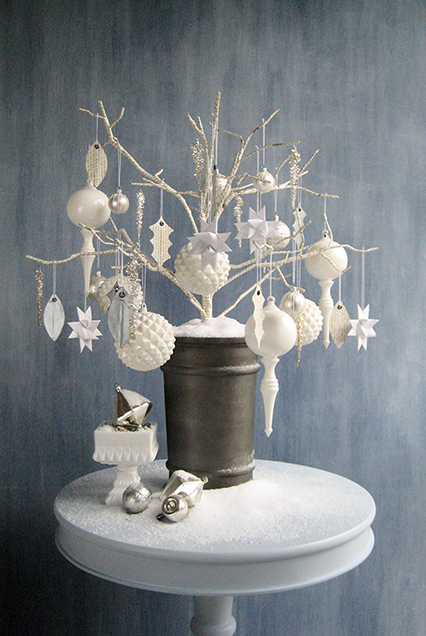 The minimalist tree is balanced and quite delicate. It's perfect for an Easter luncheon or tea. 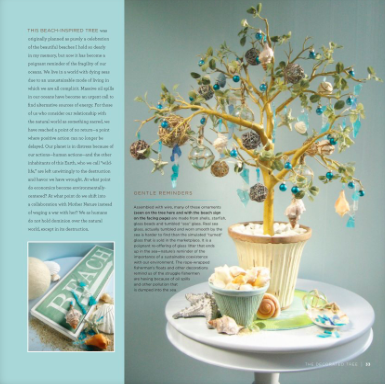 This beach-inspired tree looks sparkling with its baubles, starfish, shells and glass spheres. Although the arrangement may seem playful and cheerful, Darryl reminds us in his book of the serious impact our carbon footprint is having throughout the oceans around the world. I absolutely love this tree for so many different reasons. Below are some of my favorite posts from Darryl's blog. For this past Halloween, Darryl created a spectacular tree out of shapely pumpkins. Displayed on this sideboard, the colorful tree became an instant focal point for his room. A few cake stands set for a dessert buffet flanked the tower of squash. Spooktacular! Named after a few lyrics in a Beatles song, and inspired by the winter solstice, this tree displays a number of celestial ornaments. I like the color palette of the tree because it seems to radiate with such benevolence. These Spanbaum Trees expertly crafted by German woodworkers are superb examples of folk art still being practiced to this day. 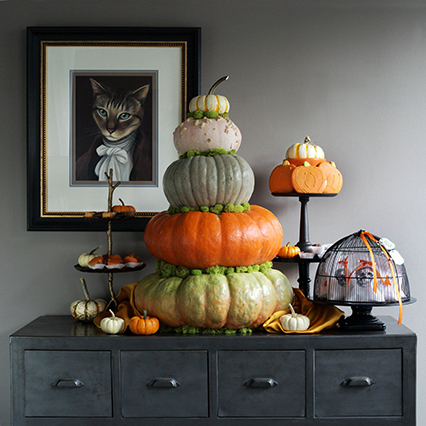 The trees don't need any other embellishments to look festive and elegant on a sideboard. I seem to remember that Martha by Mail once had similar ornaments for sale in their catalog many years ago. I've never seen a more elegant display of Easter eggs. Set on a white feather tree, the lustrous silver, gold and teal eggs, give this holiday vignette a very graceful appearance. Peter Cottontail holding the wheelbarrow filled with a glass-glittered egg, looks so dapper next to the daffodils, malted milk eggs and crackled glass eggs. 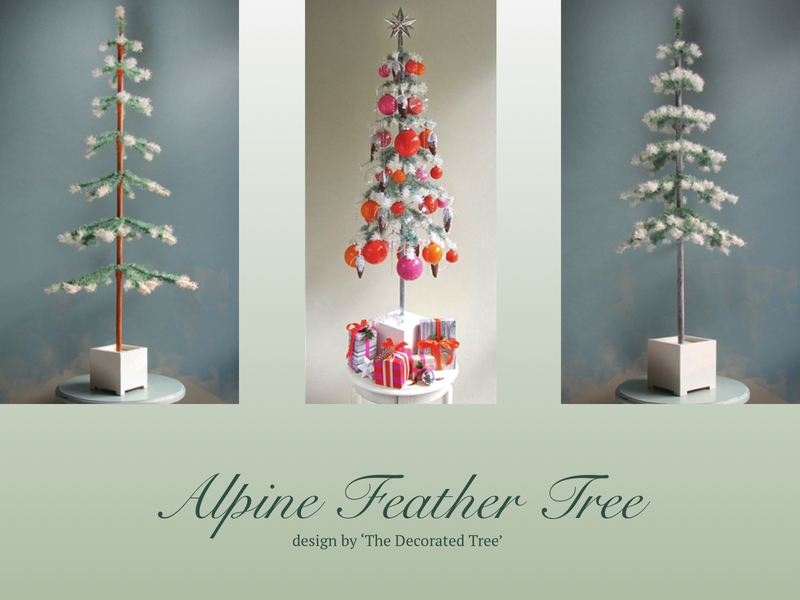 Darryl has also partnered with Home Traditions to offer two beautiful trees designed by him. The 54" and 56" Alpine trees are handcrafted by a feather tree craftsman in Ohio, and can be used for many future generations. 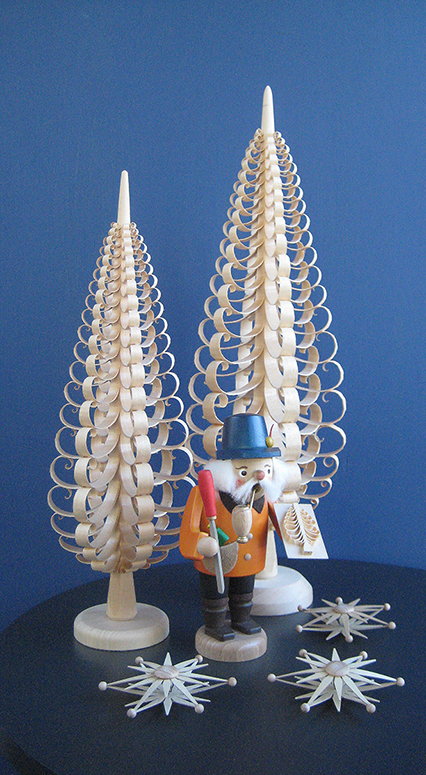 Click on the link above to get price points and more information on Darryl's trees. You're going to want one for your home to create new traditions. 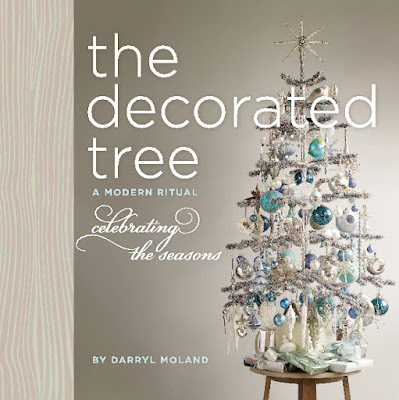 If you're in need of ideas for decorating a Christmas tree or one for a special holiday and celebration, then look no further than Darryl Moland's inspirational blog and beautiful book for designs and concepts. A well-written blog that has exceptional photography, a good search engine and one that is well-organized, will have me returning to it again and again. I have a feeling you're going to like visiting The Decorated Tree (of Life) too. Thank you, Darryl, for providing us with such a wealth of inspiration, artistry and personal wisdom!